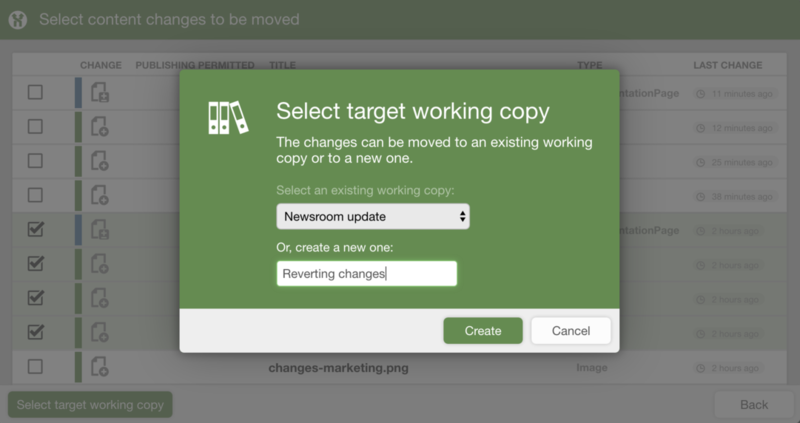 Each time a working copy is published, Scrivito adds it to your publishing history. It's the key to finding and reactivating content that has meanwhile been altered or removed from your website. 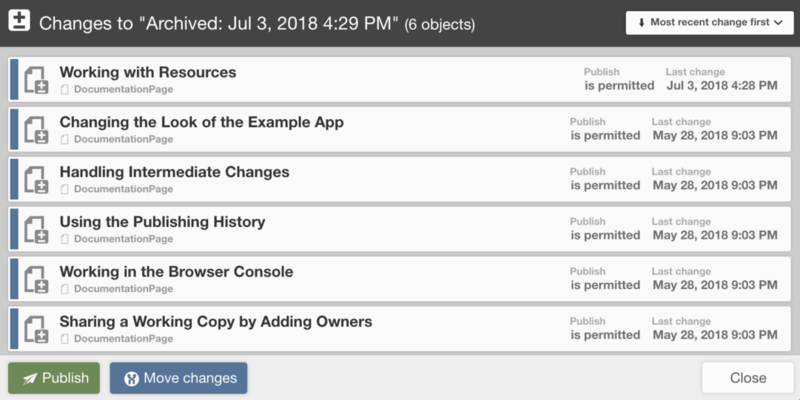 If, for example, you need to access an earlier version of a specific page, undelete a widget, or want to completely reset your website content to an earlier state, the publishing history simply lets you do it. Publishing a working copy causes the currently published content to be archived and the working copy to take its place. This way, the publishing history evolves. Selecting a formerly published version from this list creates a fresh working copy in which all the changes that were published after this version are included as reverting changes (see below for details). You can work with this working copy just as you would do with a working copy you created manually, meaning, in particular, that you can discard each and every change, or even apply further edits prior to publishing. There are many and varied possible uses of the publishing history of which the particularly beneficial ones are outlined below. Are you curious as to how your website has evolved while you were out? No problem, the publishing history lets you review all the changes that were made starting at a specific point in time. First, open the history and select the formerly published version to use as the point of reference. This creates a fresh working copy. Open the changes list of the new working copy to see which pages, images, etc. have been added, altered, or deleted. Pick an item you're interested in to view it in detail. Mistakes are bound to happen – with Scrivito, you can undo them, no matter how severe they were! What if your new workmate has “improved” half a dozen of often-visited pages by replacing your lean illustrations with “really convincing stuff”? Haven't you two agreed on having extensive changes reviewed prior to publishing them? Well, next time you'll probably point this out more clearly. For now, let's roll back to the published content visible before this happened. Open the publishing history and select the most recently published version from it. If the history indicates that the unwanted changes were made in several publishing steps, choose the version that was published immediately before the first unwanted “improvement”. As mentioned, picking a version from the publishing history creates a new working copy in which the changes published since then are reverted. 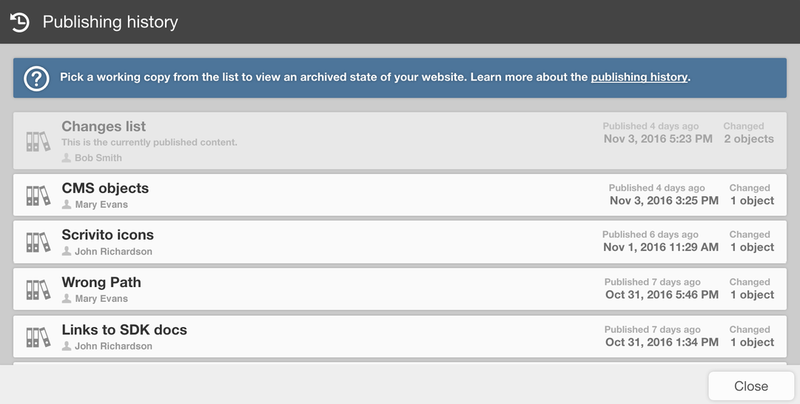 For safety, check the changes list of the new working copy to make sure that you're not undoing more than is required. Then publish the working copy to return to this “last known good” state of your website content. That's it – “unpublishing” is as easy as finding the last proper version. You could even roll back the rollback, but that's a different story. After working on large amounts of content and publishing the working copy, it might occur to you that you simply forgot to revert a few changes that have become obsolete in this process. So, how do you restore just a small number of pages, images, etc. from a previously published version to which hundreds of proper changes were made? Well, move the pages to restore to a different working copy! So, again, first choose the relevant published version from the publishing history to have a fresh working copy created from it. Then open the changes list and click “Move changes.” The items on the changes list now have checkboxes, and you can select the individual CMS objects you wish to restore. Afterwards, click “Select target working copy.” This opens a dialog box for choosing an existing or creating a new working copy. Do either of this to have your selected objects moved to the target working copy. You can now switch to this working copy and publish it right away, or review the changes, edit them, etc. and publish it afterwards. Finally, you may want to delete the source working copy that was created via the publishing history. There aren't many of them, but it's important to know them. First, if the maximum number of working copies your plan includes has been reached, you won't be able to utilize any of the archived versions of your published content, simply because a fresh working copy is required for this. Second, the maximum number of archived versions presented to you depends, again, on the plan. So, with a small plan, if you're publishing frequently, archived versions may quickly disappear from your version history window. Scrivito doesn't support an unlimited number of archived versions per CMS, but upgrading your plan will definitely broaden your scope of action.